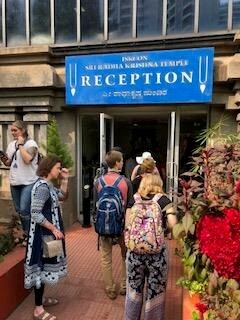 On Sunday, December 16th we had the opportunity to visit two very interesting places in the rural areas outside the city of Hubli in the state of Karnataka. The first stop was in the morning to a village school. We rolled into the dusty courtyard of a very simple school and were greeted by the shy smiles of school children of all ages. We spent a good bit of time just interacting with the kids. At the sight of phones and picture taking, many of them shouted “selfie!” with glee. This school was government-run but had an English program to teach the rural children written and spoken English. This program is sponsored by the Deshpande Foundation. This foundation also has many other programs to educate children and teach dropouts basic skills to make them more employable among other things. The children very much enjoyed getting to engage with native English speakers. They proudly asked what our favorite color s were, what our favorite foods were, and if we enjoyed India. When visiting places like this, it’s easy to get hung up on what these children don’t have and how stark the poverty is but the important thing to notice is their fierce spirit and infectious enthusiasm to welcome strangers and interact with them. I very much enjoyed getting to meet these children and share in the joy of reaching out to new people and being greeted whole-heartedly in return. After visiting with the students and getting the grand tour, we read short stories that we had written during our long train ride from Bangaluru. They seemed to enjoy them, getting to see the various art skills and things presented in our short books. Later that day we visited a farm that is included in what’s called “The Farm Pond Project”. In India, there are monsoon seasons and seasons of drought which heavily impact their economy due to the fact that agriculture makes up about 60% of the national GDP. Farm ponds are an innovative way to make sure that farmers can water their crops year round. During the rainy season, the water drains down into a pool and then is redistributed to the crops as needed. The farmer that we spoke to was immensely proud of his work. Interesting enough, the farmer we spoke to was a mechanical engineer but decided that he wanted to be involved in agriculture instead. Overall, it was a wonderful day full of laughs, education, travel, music, and just an overall sense of adventure that made this trip so fantastic. The morning of December 12th began with sounds of roosters crowing and crows cawing. The majority of our group convened for breakfast at 7:30 a.m. in block IV of Christ University’s campus. We boarded the bus at roughly 9 a.m. and headed to our first NGO (non-governmental organization), the first of many. 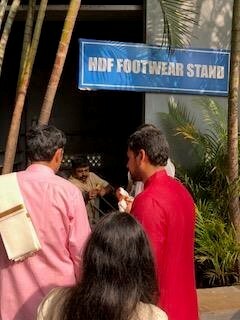 After an approximately 42 minute drive, we arrived at the Krishna temple where we were directed to remove our shoes, as they are not allowed within the temple. The Krishna Temple was astonishing. As we walked through the different parts of the temple, we figured it would be fitting to snap a few pictures while inside, only to find out that taking pictures was not allowed. However, I was able to get a shot before I was informed. Luckily, we were able to take pictures outside of the temple. Briefly, The Akshaya Patra Foundation is a not-for-profit organization headquartered in Bengaluru, India. The organization strives to eliminate classroom hunger by implementing the Mid-Day Meal Scheme in the government schools and government-aided schools. Alongside, Akshaya Patra also aims at countering malnutrition and supporting the right to education of socio-economically disadvantaged children. We were fortunate enough to learn more about Akshaya Patra during a presentation. It was evident that they are doing amazing work throughout the country as many other entities partner with Akshaya Patra. The name came up many times as our trip progressed. After the presentation, we took a tour of the kitchen. Their state-of-the-art systems has attracted many others from around the world. The next stop was one of the many layout communities in Karnataka. This was one of the most humbling experiences I’ve had in my lifetime. I wanted to avoid taking pictures of people, as I did not want it to appear as though they were some sort of exhibit unless the people insisted (which many did). Walking through the layout community afforded me the opportunity to purchase a handmade bag made out of recycled juice boxes. I thought this would be a great opportunity to not only support the work of the women, but it would also serve as an awesome gift to someone back home. Before departing for India, I was tasked with researching self-help groups within the country. It was great to be able to connect the dots between my brief research and witnessing the self-help group in person. I was amazed at the structure and sense of collectivism among the group members. As our day came to a close, I used the bus ride back to Christ University as a time to reflect and process the day. My observation was that no matter their circumstances, the people we encountered today appeared to be genuinely happy.